The Lake District is a walkers dream come true, there is breathtaking scenery around every corner from the many lakes, mountains and beautiful villages nestled between the two. The number of walks available is almost daunting and is sure to keep you and your dog amused on your pet friendly break. Whether you are a casual walker and like to amble gently through the beautiful lakeland scenery or you prefer something more challenging over tougher terrrain the Lake District offers a rewarding range of routes suitable for all walkers. 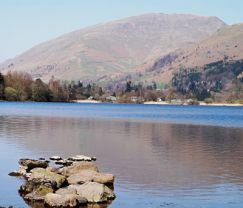 There is also a strong arts and literal history to the lakes with Beatrix Potter, John Ruskin, Arthur Ransome and William Wordsworth all taking inspiration from the beautiful surroundings. There is even a weekly poetry reading during the summer at Dove Cottage, the home of William Wordsworth. From our point of view a trip to the Lake District wouldn’t be complete without a trip to the Gingerbread shop in Grasmere, the Gingerbread is out of this world, made from a secret recipe and only seems to get better with time so our advice would be to stock up! 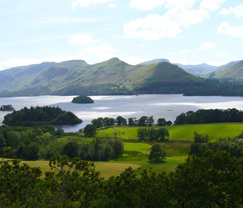 Derwentwater is described by many as a highlight of the Lake District, you can take in the beauty of the lake on one of the many surrounding walks or by hiring a boat to explore. If your feet need a rest from all that walking a trip to the village of Windermere and the dog friendly lake cruises can be a great way of exploring the lake and recharging your batteries. It is a wonderful oppuntunity to take in the breath taking views and soak the sunshine during the summer months.